Must Have Teenage Mutant Ninja Turtles and Speed Racer DVDs. GO SPEED RACER, GO. My son was a real trooper over Memorial Day weekend. He and I drove to State College, PA, to watch his sisters’ play in the Happy Volley Volleyball Tournament. The prospect of driving alone was not appealing to me. I’m usually the passenger. The thought of driving with my talkative, ever-so-slightly argumentative son was a little daunting to me. Until Speed Racer The Next Generation: Comet Run The Movie arrived in my hot, little hands. I knew just when to show the movie. My son watched it going to Penn State and coming home. In 6-year-old speak…”I love it!” and “Let’s watch it again!” I’ve not watched it, but only listened to it. The DVD, released in May 2009, retails for $14.98. Kids, start your engines! This May, an all-new Speed Racer The Next Generation adventure from Lionsgate races its way onto store shelves. Fans should prepare themselves for more thrills, spills, and high-octane action as Speed Racer The Next Generation: Comet Run The Movie follows the first two movies from the new Speed Racer series. In this new adventure from the hit Nicktoons series, Speed and his friends take on an extraordinary Eco-Car in a pulse-pounding 3-day race to win the deeds to a trillion dollar company. 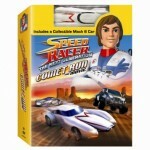 The all-new DVD release comes with a collectible replica of the cool new Mach 6 toy car for kids to play along with at home. COWABUNGA! I also got a set of Teenage Mutant Ninja Turtles DVDs for Season 7. My son watched Season 7, Part 1. He never took his eyes off the screen! It’s been 25 years since Leonardo, Michelangelo, Raphael, and Donatello, emerged from the sewers of Manhattan and were transformed into heroes-in-a-half-shell battling petty criminals, evil megalomaniacs, and alien invaders. To celebrate the 25th anniversary of the Teenage Mutant Ninja Turtles®, Lionsgate Home Entertainment is presenting all 27 episodes of Teenage Mutant Ninja Turtles: Season 7, available for the first-time ever on DVD. Fans can collect the commemorative set that will be sold as four separate DVDs, each featuring different episodes from Season 7 and a Mini-Classic Turtles Action Figure! All four DVDs feature a different turtle on the cover, and fit together to create one power-packed scene with all of the wise-cracking, pizza-obsessed superheroes aligned and ready for battling evil. The Teenage Mutant Ninja Turtles: Season 7 DVDs will retail for $14.98 each.